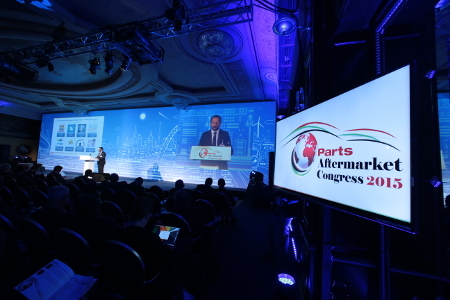 The 11th Parts Aftermarket Congress took place on the 1st and 2nd of October in Baveno (Italy). TecAlliance was one of the main sponsors of the event, which has become one of the most important dates on the Italian aftermarket calendar. Fabrizio Giannelli, Director Sales Northern and Southern Europe, was on site for TecAlliance. More than 370 participants from the industry and trade arrived at Lago Maggiore from many different European and even non-European countries. Over two days, expert contributions provided an insight into the industry’s development: Future trends, the role of manufacturers and the challenges the trade and workshop services face. In addition to top class presentations, the event is marked by its excellent networking opportunities. “The Parts Aftermarket Congress is a great opportunity to both keep up to date with the technical side of things, and especially, to meet high-ranking personalities from the industry and to engage in a personal exchange with them. This always results in valuable, new international contacts”, says Giannelli, describing the benefits of the event. Next year, the Parts Aftermarket Congress will take place on 13th and 14th October in Baveno (Italy). The presentations provided participants with up to date information about trends and developments in the independent automotive aftermarket.